Foreign Affairs Minister Harry Kalaba has dismissed the letter and contents written by UPND President Hakainde Hichilema as an act of serious desperation and hopelessness. Mr Hichilema has written to United Nations Secretary General Ban Ki-moon seeking intervention over President Edgar Lungu’s threats on democracy and the breakdown of law and order in the country. Mr Hichilema’s letter was copied to South African President Jacob Zuma, SADC Chairman Ian Khama, COMESA secretary general Sindiso Ngwenya, Chairperson of the African Union commission Dr Nkosazana Dlamini Zuma, Dean of the African diplomatic corps David Banda and International Conference on the Great Lakes Region (ICGLR) Executive Secretary Muburi Muita. Mr Hichilema also wrote to American Ambassador Eric Schultz, Commonwealth Secretary General Patricia Scotland, chairman of the African Union Idris Derby, New Chairman of the African Union Paul Kagame, Ambassador of the Commission of the European Union to Zambia Alessandro Mariani and SADC executive secretary Dr Stergomena Lewis-Tax. “Recent events in our country give rise to serious concerns on our part, which require the attention, intervention and urgent engagement of your organisations. We are immensely proud of our country’s previous peaceful elections and we would not like this record to be tarnished. Recent acts of State and political party violence have put our country in a state of uncertainty and the potential for breakdown of law and order which could quite easily degenerate into a civil war, which must be avoided at all costs,” Mr Hichilema stated. He observed that all previous peace agreements between political parties had failed. “The leaders of the three church mother bodies brought all the major political parties together on 29th April, 2016 where they made a commitment to campaign peacefully during these elections and to reject violence. These commitments have sadly broken down and are not being honoured. Recently, the Electoral Commission of Zambia (ECZ) suspended election campaigns for 10 days in Lusaka and Namwala districts on account of reported violence, but it has become a notorious fact that branded motor vehicles of the ruling Patriotic Front (PF) which were prohibited by ECZ continued to campaign especially in the capital Lusaka, without being stopped by either the police or ECZ, causing anger and frustration on our part and others taking part in these elections,” Mr. Hichilema stated. He stated that if the situation remained unchecked, it would produce serious consequences for the country. “This state of affairs is menacingly leading to a breakdown of law and order in our country and concerns to this effect have also been voiced in equal measure by the Human Rights Commission of Zambia, the Law Association of Zambia, the Non-Governmental Organisation Co-ordinating Council and the Southern African Centre for Constructive Resolution of Disputes (SACCORD), who have accused ECZ and the Zambia police of being biased against opposition parties,” Mr. Hichilema stated. But Mr. Kalaba stated that Hichilema was fearful of an impending fifth straight loss and was now making desperately wild claims to attract international attention to himself. He said that Zambia is a democratic state that runs free, credible and fair elections and Mr Hichilema was afraid of the impending rejection from Zambians that he would face next week. He said the act by Mr Hichilema was desperate and highly unpatriotic and was surprised that any Zambian could write such a letter against his own country. We have learnt with sadness that United Party for National Development (UPND) leader has written an unpatriotic letter to the United Nations and copied it to the African Union, International Conference on the Great Lakes (ICGLR) and other bodies. The gist of this letter is the preposterous claim that Democracy and Freedoms have been eroded in Zambia by the government of President Edgar Lungu. We suspect that Mr. Hichilema is smelling a clear electoral defeat, a straight 5th personal loss for him that he can’t appear to stomach. We are shocked that any citizen of this peaceful and democratic country could write such a demeaning and unpatriotic letter against the spirit of his own country. It is imperative to state that the basis and foundation of his letter holds no truth and is an attempt to merely scandalise the credible electoral process. President Edgar Lungu has been at the forefront of ensuring that Law and Order is preserved and the inter party violence incidences were curbed. On the other hand, Mr. Hichilema has promoted activities that violate peace, law and order by defying the law and public order act. He is on record as the only political leader who refused to be part of the peace efforts initiated by the ECZ Zambia remains a peaceful country and will hold credible, transparent and democratic elections. Mr. Hichilema has been able to hold public rallies and meetings without hindrance or stoppages. Government has invited local and international observers to witness this process. We therefore call upon Zambians and the recipients of this desperate letter to dismiss its contents and regard it as only worth for its nuisance value. We also urge Mr. Hichilema to recognise that his acts of unpatriotism against his country is so regrettable that it amounts to sabotage and beneath the call of a man aspiring for the highest office in the land. Mr. Hichilema is expected to express sincere gratitude and patriotism to Zambia and its people for all the country has given him. His hypocrisy and desperation speaks volumes about why Zambians have rejected him for four times in the past and are most likely going to reject him for the 5th time. Why was’t HH’s letter circulated to Mugabe and Yoweri Msveni? HH is a Treasonous Tattler. Always selling out Zambia! Put him back with his cows come August 11th! I am sure he’ll be referred back to the observers on the ground representing various international organisations……….very under five. Where did Harry Kalaba send that childish response? I hope was just a draft to PF secretariat. Such writing is clearly a resignation letter of a desperate minister. When we say HH is delusional and infantile, this is exactly what we mean. It’s not like ECL has deployed soldiers on the streets beating up people. We don’t see Zambians trekking to neighboring countries in fear of their lives not to mention the letter he circulated was written from the comfort of his mansion not prison! KALABA, take it easy mune, we know your job is hard!! CLEANING UP AFTER CHAGWA, especially, now that he is having diarrhea NON-STOP!! Careful, your eyes might pop out of their sockets!! Word of advice – learn to the the signs when the ship is about to sink – see your friend, former LEGAL Minister, basically, he withdrew himself quietly by not filing in his candidature – he is not st-u.p.id – he knows what he is on about!! YOU JUST BE QUIET – TONDOLO MUSUMA!! Vote WISELY 11/8/2016!!! Vote ZAMBIA FORWARD!!! Vote UPND!! ……Learn to READ the signs……. This coming from a man whose Vice Presidential pick is a violent wife batterer! Does this man HH even sleeps? ECL can not take zambia to such limits this kalusa is talking about. How much has he borrowed which is making him lose even his sense of patriotism? He wants foreign troops to start attacking us for nothing. HH WILL LOSE FARE AND SQUARE. Whatever violence has happened in zambia will NOT justify his evil plans after elections. Its just politics and get a life please. Sorry meant FAIR and SQUARE. I went to a tonga school. HH is silly. who has been promoting violence? is it not his cadres and PF cadres? Who has a record of almost mudering even cadres from the other opposition parties? Has he sent a video of the FDD lady being hacked by his cadres as well? 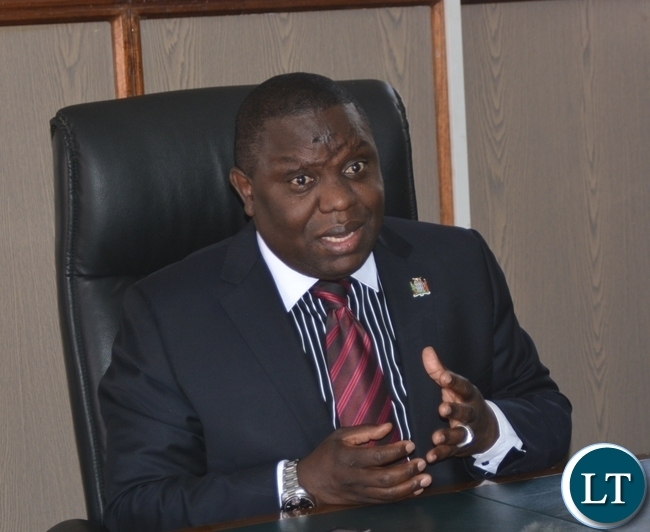 Has he send videos of PF cadres who have lost their lives at the hand of UPND cadres. Ba PF naimwe wake up. This ***** will smear blood on u if u are not careful. He wants to come out clean on violence which he himself has encouraged. Kalabas letter is not sufficient to counter react to this mans lies. I demand that you Mr Kalaba should analyse this mans lies and send a more detailed letter explaining the situation on the ground to the same recipients. If u dont have good analysts please contact me. What a useless opposition leader. Ataseeeee. I must warn PF cadres that every life including that of Mapenzi is precious and must not lost easily like dogs.We in Zambia we can not be held to ramson by Chakolwa called Edgar Lungu as if we have no brains. Zambia is part of the international community and so its answerable to UN ,SADC,AU and The international Criminal court were the current president of Kenya was supposed to go and answer changers on Human rights violets and Genocide. One Ka Edgar should not push us too far. we warn him he should not push us to far. YABA BA HH. IF YOU CAN’T HANDLE IT WITH YOUR SIBLINGS AT HOME THEN YOU CAN HANDLE IT OUT THERE. IF THE SITUATION WAS AT THAT LEVEL, THE UN WOULD NOT WAIT FOR HH TO WRITE TO THEM. THEY KNOW MORE THAN HH DOES. YOU CAN’T MAKE UN ACT AGAINST NOTHING. I cannot be CRYING WOLF in every election since your DUBIOUS TAKEOVER OF UPND and expect serious people and organizations to take him seriously. These people have REAL and not IMAGINED political conflicts to attend to. If you have time to waste, why don’t you try wasting it on constructive and worthwhile ventures. Ventures such as attending Church and preaching to your own political goons and hooligans negatively contributing to the same unstable political atmosphere you are complaining about? …surrounded yourself with a borrowed and disgruntled political cartel PREACHING AMAGADON instead of peace, yet you still think people are stu!p!dy and will believe this load of horse manure. Haven’t you tried this PLAY VICTIM [email protected] for far too long without any tangible results to show for it? And you wonder why Zambians have rejected you so many times? LOSER! No apologetic. On this mischievous action, Hichilema has proved beyond doubt that he is childish, unpatriotic, impulsive, reckless, ignorant and useless by every measure. Kwamana he has lost it to Lungu again and knocked himself permanently from Zambian politics. Harry Kalaba is a very dull man instead of doing a point by point rebuttle of what HH wrote about, he glosses over the concerns of an interested citizen and uses it as an opportunity to talk about the results of elections which have not been counted, not rven cast yet. I can assure that people who received HH letter will read the issues raised and verify if credible. Kalaba who is supposed to defend the republic if HH concerns are baseless opts to launch a cheap political shot. These are the people representing us? Zambia we can do better!!! Harry is not dull. he has merely analysed HH’s letter correctly and responded as government. remember, there is no vacuum of government in the country. It is the responsibility of government to protect this country from anyone trying to tarnish the image of this country unfairly. So Harry is doing his work and HH is not. @Asigai or is Asinio: Mother Fuc.ker you are. You are writing that sh.it with your fat smelly Ar.se seated comfortably in a foreign country where there is law and or.der leaving your country being abused by Lungu with random shootings killing opponents!! May Jesus shoot and kill you in any way possible. You hedgehog!! Am on the cross road now. Which way to go now my God? Am at mandevu rally, mutambe grounds. UPND is unstoppable!!! Come and see for yourself!! Dununa forward ne Zambia…abash reverse PF gear. Just watched on Muvi TV. Mrs Mwanawasa even complained that there was few people because of some person who was stopping them. I don’t know whether you’re really referring to the Mandevu rally. It’s not adding up with what you’re saying. Thank you illegal minister for uttering that rubbish. Yesterday cadres were grabbing Post Newspapers from vendors to you that is peace. ZRA has refused to obey court orders to open the post to you that is peace. An innocent woman was shot dead by the police to you that is peace. Cadres trying to bring down the plane in Shiwangandu and Ndola International airport and to date they have never been arrested to you that is peace and credible. Ati you moron.Smell the coffee f00l by now you should have been on the fence at the very least.Let me try to help. @Mailoni, f00lishness resides in your body. You are spending money and time chasing election materials as premarket ballot papers. That idiocy may work in times and places where they transport ballots to be counted elsewhere. This time we count at poling stations in full view of your agents. Do some growing up with your master Kalusa! HH raises serious concerns in his letter. The letter can only be dismissed by a myopic person! Imagine that Edgar now feels like it’s up to him for Zambia to have democracy? If he wants he can cancel it? If he wants he can be tyrant? What kind of wrong thinking is that? Why should we tolerate that? Edgar needs to be stopped in his tracks before he destroys our country! HH has done well to write to the UN with copies to all the other international bodies. PF IS SHOWING DANGEROUS WICKEDNESS. Well said. PF carders should not underestimate how seriously the international community takes these things. Developed countries are tired of hosting refugees running away from conflict or persecution in their own countries hence their approach has now changed, they now prefer to intervene incountry rather than watch and wait for catastrophe. The only reason Museveni has gone scot-free is because he is a strategic ally for the US. There is a lot of documented evidence against you and your group in this year alone. Pictures and video evidence have been recorded and filed. For the first time in the Zambian history. Whether you retain power or not time will come. Everything has its time. It is only PF and its cadres that take Kalaba seriously. For serious Zambians and the international community, he is a comedian who should be completely ignored! He has never said anything sensible! Don’t insult commedians they make an hornest living.This giant midget is a part of the thieves that have destroyed our beautiful country within 5 short years whilst enriching themselves to unbelievable levels.Call him prospective convict. Whoop! This shrill is really annoying. HH has completely lost. I have never seen a presidential candidate in this country so unprepared and weak. HH is extremely undemocratic and unreasonable. It is only less than 5 days before the General election and he is already making a mess of himself publicly. I have a strong feeling, he knows that he is losing this election. He has seriously undermined the noble works of the ECZ despite its efforts to put up a credible election amidst nasty unproven suspensions. Edgar thinks these elections are like those they conducted for PF at Mulungushi Rock of Authority with Willy Nsanda where they intimidated their opponents with pangas. Their opponents failed to show up in that arena because they feared to be attacked resulting into declaring himself an opposed. These elections are different mwana and are a national events. Manipulation will not go that easy Sir Mr. Hambo man. Ba Harry, ukwishiba ukulanda ichisungu tamulesova what we are going through. You are the people we elected in Government to uphold democracy and you promised to be our servants once in power. Max muli Dora ‘s team bali bekata na ma weapons, for what? and yet you want to defend ifyabupuba. Dont’t annoy me bwana. Why talk about a fictitious character? (HH) is a crying underpants baby. The wimp has lost it completely. He has now gone mad. The miserable wankar doesn’t know what to do in the last few days before elections. He’s a desperate swyne together with GBV and the ailing Boer thug Scot Mmembe Inc.
Is UNITED Nations serious on Africa last time someone said it was a failed state and UN didn’t show up. Stop dreaming HH UN must go to South Sudan not zambia. We are ok here just waiting to send you bk to granny at the farm. Tell that to the families that have lost loved ones ! Why do we still continue calling these ***** ministers? These people are illegally holding such titles, offices and misusing GRZ resources without shame!! Do you read the Zambian constitution. Of so what does it say about the cabinet ministers? 1diot jayjay. You Mother Fuc.ker! Within your constitution, who qualifies to be a minister – isn’t it MPs? After they ceased to be MPs why should they still be ministers? What an ID.IOT, AR.SEWHORE you are!! Every citizen in zambia has witnessed PF brutality and intimidation. This is where lungu calls for prayers then retreats to state house to plot and instruct PF brutality on our citizens. Lungu thinks because he has built the most expensive roads in the world for zambians using borrowed money we have to vote for him……..
Everyone in Zambia has witnessed UPND violence now and in the past elections. HH has admitted that he is losing the elections next week, but he wants a way of making it look like he will lose unfairly. Serious desperation and hopelessness indeed. Viva ECL, Viva PF. Bola yakosa. He thought 11 Aug was very far! We are ready to vote. Those agencies have observers on the ground,please engage them. HH has lost it! Pure psychiatric case. It is highly dangerous to try to have HH as a president of this country. He is at the center of every mess this season’s electoral process has suffered. HH is not the only opposition leader in this country. Not the first, not the last for that matter. He has taken us through untold political breaches Zambia has never witnessed. He does not want to be governed by the nations electoral laws and he has been busy sponsoring violence from learning institutions through constituencies and theatening food security and now national security. HH and UPND have been part of our elections many times but we never experienced this kind of violence , why is it that only when lungu participates we have levels of violence never seen before ? Just let the opposition campain and let the people freely chose who they want to lead if you clsim to be popular pa PF , why all the violence ?? Violence is strong in his so called “strong hold”, SP. UPND is a very violent party ravaging there ignorant and chaotic nature even at innocent and defence less passers. Guess what? It is next Thursday and we shall sort you out one by one, losers. While there has been violence here and there both PF and UPND are guilt of it. Therefore this letter is hypocritical to blame it on the government of the day. Running to outsiders at this stage is also not good gesture as Those outsiders have representative offices in Zambia and I’m sure their representatives pass on information on anything to their principals. This doesn’t look good on HH. We remeber the bweengwa kidnapping lies, inonge winas burning house lies, Frank bwalya being attacked lies, UPND training militia on the use of boxing gloves to take on the defence forces lies, the lies of an attack on a bemba teacher in SP where the broadcasting minister went on air to support such lies and issue alarming tribal speech, just like what the hutu minister did in Rwanda prior to the genocide. All these lies are intimidation with the help of the police. HH is right to highlight this violence against people who only want to exercise their democratic rights. May God have mercy on HH, he does not know that those people know Zambia than him and what is going on they are following. BOLA NAIKOSA. Wina azalila Zambia is a peaceful nation. In the face of all election observers and members of the diplomatic Corps, not of course not invited by government, the embattled and greedy opposition leader disregards protocol and fixes himself in a race he knows he has little to gain. Guess what HH, the election will go on and the ECZ will conduct them in a transparent manner so that you lose in honor. We do not care if you are an alien or zombie, you and your cohorts will have to be subject to the laws of the land. It is shocking to Herr this after EN wired you terribly in your previous debates. HH is a snake. Lungu is the father serpent of all serpents in zambia. Even seeking and audience with the pope knowing full well he does not intended the people to freely choose who they want by unleashing his PF thugs on them. Well, this under 5 president has really gone too far and we need to place where he belongs, that ranching. Come 11th August bwana we sending you into oblivion and never to see your back again. I hope part of the evidence submitted are violence videos from Namwala and Sinazongwe, depicting your cadres brutalising opponents. Well done HH for alerting the International Community to the impending political crisis which Lungu intends to ignite by rigging the upcoming elections. Lungu needs to allow ECZ to organise these elections independently and professionally so that the elections are free,fair and transparent. Lungu is bent on rigging these elections at all costs. This must stop. We don’t want Lungu to steal our votes. Forward with HH,GBM and UPND. Desperate HH sensing a fifth straight loss. HH refused to sign a peace accord organized by the ECZ. He is a hypocrite. Sign an agreement that has no end results or ramifications for the perpetrators of violence ?? Let the international community see for them selves if there is political violence if there is not then HH will be seen in bad light, why are you panicking ? One arrow striking 9 Goal Posts.But zoona chi HH nichikali! You PF fools let me educate you.This letter is officially the beginning of Sanctions.This letter officially opens a case at the ICC against Lungu for Human Rights abuses and murder.Non of the named organisations are interested in seeing Zambia go to war,cos they depend on Zambia too for peace negotiations in other countries.So,from here,the battle against Lungu & PF is no longer for Zambians alone.As the PF wud say”” it is now global””.Watch how the ka Lungu will be phased out of our history books for G.
Just let the people chose freely who they want ad president. If HH is lying to the international community about political violence they are not dull, they will see for them selves. Why are you worried about the letter written by HH ? If it is lies the people of zambia shall judge him. @Spaka like lilo, your leader is lawless and a coward. Come 11/8 we will sentence him to retirement unless you want him to lose again in 2021. Yes we at war if people are dying every day in the hands of PF thugs.This country is civilized we cant allow the Kaponyas to take over never.Lungu will be sorted out clean. HH is an illegal, and undemocratic dictator who has no moral right to talk about democracy. His party has not gone for convention in the last 10 years, what democracy is he talking about. Because of his dictatorship, he caused the death of Hon Request Muntanga, former MP for Kalomo. His cadres have harassed and killed people from other parties in Southern Province, his tribal stronghold. HH don’t cheat anyone, you are selfish, dictator, psychophant, violent and undemocratic. Can someone also write to the people that he wrote to, to expose his hypocrisy. Let the people chose their president freely…..
That is all UPND ask. But lungu uses the police to intimidate and harass the opposition. Just recently GBM’S house in kasama was ransacked by the police because lungu was campaigning nearby. We have many many instances of PF thugs blocking roads with burning tires to stop position rallies while the police look on. Let even the Pope know that the lungu he met is a violent man who wants to impose his will on the people of zambia. I wonder if he has ever opened his mouth without cursing, mumbling, accusing and well, simply complaining. Yak! He bores me to the core of my entire physical framework. Put him in power and he will complain his entire tenure. Resist such leaders. He is lazy and will see you as a burden and insult you all his tenure. Well, HH, you will not have it your way, but the rule of law way. The national electoral laws’ way! The sober way! If you don’t like it, Go hang! It seems that you are not getting support from the father of lies – you know who I am talking about. toll on HH and his UPNDown . Bola naikosa in less than 5days to go! Iwe thorn, you have made my night????? Spaka like Lilo… I like your last comments that let people choose their president. That is maturity and this is what we must do . However please note there are also cases of UPND violence which have been documented too. Being fair minded is to acknowledge this ill and as Zambians condemn such acts. Violence is bad … To his credit HH has condemned violence and so has ECL.. this is documented. However to then write the letter which HH wrote and only blame PF may not be seen as being fair by Zambians who know about the violent acts committed by UPND. I suppose this is what happens in politics?.you remember the FDD candidate battered in Namwala?… the Mazabuka murder? The violence in Mwandj not so long ago to name but a few…. Surely how do you say President Lungu is the father serpent of all serpents in Zambia if I may ask who runs away from prayers! How can this stupid ka witch of a chap be a minister of finance with such levels of dullness and mediocracy? You will not utter such nonsensical responses in by the end of next week. Yours is a very stupid government and an embarrassing one. If you think everything boils down to politics wait until next week when you will be on the other side of the isle. you will surely realise why good laws are good for everyone. Meanwhile Zambians lets all go in numbers on thursday and ensure we bring normacy to our country by voting for UPND. Its a sure way to say no more machetes in our country and no more corruption, no more killings by the state and no more expensive meali meal, no more insults from stupid leaders. Vote for the HH/GBM ticket and abash confusion and cluelessness! Bushman kalaba, you are the one who is an *****. Why are you scared now? Don’t you see or read threats from your president. Don’t you see the injustices from chagwa, beatings, znbc coverage, it’s only PF, police killings, all on you. Just shut up, and enot the short lived 5 days nd wait to hand over to the new government mwembwamwe. This leader of the NGO called upnd is really desperate!! Even a sophomore at the University of Zambia can do better than this self proclaimed economist! This boy Ichilema does not even understand what he is talking about! We are tired of hearing Ichilema’s nonsense! Thank God we are remaining with few hours before we put the final nail in the head of this unpatriotic tonga chap! HH you have done well. prevention is better than cure. We don’t want what happened in Kenya to happen here. We value our country very much. We don’t want the accidental President to spoil our country. Even those who win lottery don’t prosper well because they don’t work for the money. Zambia has been a peaceful Country until the panga family took over everything has gone wrong. This illegal Minister is not addressing issues raised by HH. Instead Kalaba is scared that this PF violence and misrule might become a SADC and UN issue. Lungu is trying to rig these elections in Zambia in the same way Gbagbo of Ivory Coast did. If Lungu is not careful he will soon join Gbabo at ICC in the Hague for committing crimes against Zambians. Forward with HH and UPND. Umwenso Ba under 5 apapene mwatampa ukulila, leave politics my bro if you’re not strong! Some leaders’ IQ is really questionable! Going to the UN? Thank God next week this guy (Hazalusa Hagain) will not be news again! What a shame! @Habanyama alias @mwansa of RSA, it is time you began rehearsing the exit plan of a man who has been losing for the past three decades! HH writes to UN hq forgeting that their EU,COMMONWEALTH observer teams has been in zambia for the last 4 weeks just for this election. HH lost in this political jungle, Anyone to help him please……. Threats threats are no good , they can turn against you. Don’t intimidate your opponent just follow the right procedures of winning an election. It is not about Hakainde but people of Zsmbis who are to decide not rigging but instead let the people choose a president of their choice don’t impose yourself on majority Zambians who are suffering. No bloodshed for clinging to power it is not fair. ONLY a scared and heavily scarred Minister without brains can send such a letter full of insults and no facts to international dignitaries. Really, how could a sane person do that. Kalaba is mad BUT whether they like it or NOT, they, PF, will all BE going. PF Mother FUC.KERS!! If the people to whom this letter was written to had any doubt about its contents, Harry seems to have just sent a confirmatory note to them. Harry should have refuted the allegations word for word without paranoia. The drinking dancing president has promised to introduce draconian measures if HH disputes election results. Now how the hell does Lungu know he will win? He has also proved that despite his humble facade inside his heart there lurks a vicious ruthless vindictive mentality that would not hesitate to spill blood. He hasn’t been able to hide this ruthless and violent streak. He has used it time and again with impunity right under your noses and you still doubt his evil intentions when he loses the election? HH is right to stay alert and warn us of the satanic machinations of the evil one in state house. This is a ZAMBIAN problem so why run to the USA controlled un? For your info USA sponsors wars so that their arms industry can have a market. HOURS FROM THE HH DEFEAT – A SLAVE IS SUBORDINATE TO THE MASTER! It is almost settled. My wife, first born daughter and I will walk to the booth to each give Chagwa a job. Haters wanna hate but the actual fight is in the polling booth. I am shocked to learn that this season of elections has brought to the fore job-seekers (Team GBV-M/HH) bent at insulting the employers(electorates) with impunity. Blasphemous indeed! Umupamba! Abomination! Cry babies! HH SHOULD HAVE INFORMED THE UN THAT HE TRIED TO SEARCH ECZ TRUCKS BELIEVING THAT THEY WERE CARRYING PRE-MARKED BALLOTS, BUT TO HIS SHAME, THE TRUCKS WERE EMPTY. I do believe, in all honesty, that HH & UPND have the correct thing to alert all those informed. There’s nothing unpatriotic about that. When the peace obtaining Zambia goes aflame especially as result of the unfair electoral practice of “stopping some parties from campaigning while not reacting when the ruling party continues to campaign freely” these organisations will be affected in one way or another. No man is an island, they say. Only a myopic mind woyld disagree with this. When our neughbouring countries were fighting their ‘wars’ we in Zambia were affected and the reverse is also possible. You can not ignore that fact. God bless Zambia. Forward with progressive minds. Zambians please I beg you, reject this Kachema called HH, uyu chikalour aya sana, Time to teach him another lesson for the 6th time, HH wabe ithole, id1ot kachema. This buffoon if he is allowed so much freedom, will cause flames on Zambia, time to retire him and his entire cabinet of Fat Albert (GBM), Guy Scott, Masebo, Kilometre Sampa, all these people don’t mean well for Zambia. Electorates use your heads, these people don’t love you at all. It’s you who is an insulting PF thug that needs to be caged and castrated. HH is winning this election. Not for himself or his team. But for that graduate who remains unemployed four years later; the civil servant who has had no increase; the doctor agonizing over a dying patient cos there pharmacies have no drugs; the marketeers being levied by PF thugs. Dununa Forward! Paka litente …paka litente..paka litulike!! Kalaba , his wife and relatives will be protected by commandos while the poor zambian people will inhale tear gas and get live bullets. Lungu is serious. he think is fighting HH but in esssence he will fight the zambian people. HH AND HIS FOLLOWERS STILL DONT BELIEVE THAT ZAMBIA IS A PEACEFUL NATION. THEY LIKE IT OR NOT ON 11 AUGUST WE SHALL WAKE UP TO GO AND VOTE. THERE IS NOTHING THAT WILL HAPPEN AT ALL. THAT VIOLENCE IS BEING CREATED IN THEIR HEADS BECAUSE OF FEAR OF THE UNKNOWN. WE SHALL VOTE GO BACK TO BED AND WSKE UP ON 12TH TO RECEIVE RESULTS OF WINNERS AND LOSERS. WE HAVE GONE THROUGH THIS PROCESS BEFORE. NOTHING WILL STOP US. ITS DONE! Despite PF thugs in Lusaka CBD, I urge UPND members to adorn party regalia as a defiance against Lungu madness and recklessness. Paka litente …paka litente..paka litulike!! Aren’t you ashamed of your hate and lies. How many votes did HH get compared to Lungu? In this election, PF will kiss dust. It’s simple. Sontapo..nasonta pali corruption, price increases, theft, threats, PF violence and thugs…. Serious desperation and hopelessness indeed. It’s been one accusation after another, all proven to be false. Bola naikosa for our colleagues in UPND. Let’s teach HH a lesson on 11th August. Viva ECL, Viva PF. Well done Bwana Hakainde , this selfish ECL and his abuse of power will lead Zambia down the drain of bloodshed like Kenya and Rwanda. Next will be a case at the ICC against Edgar Lungu and his bloodthristy PF compatriots. Good question….what is very worrying is the negative perception being created out there that Zambia is a violent country… People with capital will shun Zambia because of this perception. Is UPND not freely compaigning? …One unfortunate incident in Chawama which police advised could turn violent ….but against Police advice UPND proceeded to march to Chawama…Were they not allowed to hold a rally in the end? ..We understand it was a successful rally…so? This is very disappointing to come from a man who wants to lead this nation some day. Just a word of advise the American intelligence ie CIA and FBI work in Zambia reviewing the security situation on a daily basis. USA knows all about the violence both UPND and PF have caused so far. Concerning civil war in Zambia, we forbid it in the Name Of Jesus Christ. Everyone organizing violence may Jehovah judge speedily. May their senses and reasoning be confused like those people who were building the tower of Babel. May the God of judgement defend this nation. God bless Zambia, God prosper the nation of Zambia. Peace over Zambia, peace for everyone in this nation. JESUS IS LORD OVER ZAMBIA. God will not listen to your lamentations if and when the suffering is self inflicted!! You let Lungu bring his militia and afterwards you want God to bring peace – how stu.pid! First of all, you should stop Lungu’s mischief and then ask for peace from God. HH has taken a lot of money from international multinationals promising them to takeover mines when he wins. But as operation CNN (copy nega nega) gathered pace, HH has realised he stands no chance as Easterners will this time cancel the tribal vote in Southern Province. Zambians honestly don’t give a $hit about what foreign governments got to say in their internal affairs. Zambians don’t need the validation of any external power to do whatever they want to do. HH HAS BEEN PLAYING THIS GAME SINCE SATA WON THE ELECTIONS. TRYING TO CRY TO THE UN AND FOREIGN NATIONS FOR SYMPATHY. HE HAS BEEN HOPING THAT THE OUTSIDE WORLD WILL PUNISH ZAMBIA. BUT TO HIS SHAME, NOTHING HAPPENS. THIS TIME IT WILL BE TOO SAD FOR YOU SIR. HH has been promoting violence, evidenced by his refusing to sign the peace accord and branding peace prayers as devilish and declaring Armageddon on Zambians. We are not stupid as Zambia yes a few will vote for HH the war monger but majority will vote for Lungu the peacemaker. For blessed are the peace makers!. He should not think the International Community is not following the events in Zambia and recognise his own role in all of this. What a childish politicianhe is so unpatriotic and unfit. If there were no choices Muliokela would be better. But as it is we have choices and Iand my family we will vote for ECL. This is the first time ever that Zambia has witnessed high levels of violence, it is a reality that people are being battered by PF cadres. Honestly, this has to be reported objectively, Kalaba is just playing politics. These cadres they have unleashed on the streets will backfire big time one day. Mind you, these are former Kaponyas who are being glorified for causing serious injuries to people who do not support the PF. Lungu knows the consequences of losing elections, the guy has stolen loot and he is scared that he will be dragged to court. @Hachilufya, please just accept that Upnd is equally guilty or even more than the PF. Justification of violence is wrong no matter who it involves. By the way inform HH that the UN are actually represented in Zambia and know exactly what is happening. No need to waste ink. Open up your eyes, if you love our nation, you will look beyond what the media wants you to believe and realise that there is merit to HH’s letter. All he is seeking is observation from external and disinterested parties for the perseverance of peace. I have given up on this blogger Mr Spaka like lilo, does anyone understand what he is talking about? So what is U5 talking about? Tell U5 to have sympathy and empathy for God’s people both at home and abroad. Those international agencies are busy trying to resolve the human crisis in the middle, siuth sudan, Burundi and other hotspots. Surely HH reads about the refugee crisis in the middle east and other areas, those malnourished refugee children whose mothers cannot breadfeed them because the mothers themselves are malnourished. . The resources are limited too. Then this HH creates an imaginary crisis for busy and serious world leaders only because he HH wants to become president of Zambia! Imagine what those malnourished refugees would say about HH if they read his letter which basically and inhumanly tries to steal the attention which they deserve and are begging from all of us. I keep repeating, U5 has the propensity to shoot himself in the foot at critical times. Look at his behaviour at the ECZ meeting where diplomats like Janet Rogan, UN resident Coordinator, was in attendance. Obviously she immediately briefed her boss Ban ki Moon on HH’s uncivilised conduct. And now U5 writes to the same well briefed Ban ki Moon portraying himself as an angel! U5 has shot himself so many times in the foot. This latest gaffe is not the last one at all, for U5 four days before elections is plenty of time to pump in a few more bullets in his right and left feet, ensuring that he loses again. One wonders, is U5 bewitched or cursed or both? It is shallow thinking by HH for writing to all these guys mentioned because they have their own problems and I do no know whether the UN will resolve them. Kagame Paul went for a third term by hijacking their constitution and where was the UN. Jacob Zuma is still balancing on thin line in SA and HH is adding more worries to him apart from what he has at hand. America has the ISILS and remnants of BIN LADIN followers but up to now they have not made any signficent gain in defeating them and instead looking at peacecfull country like Zambia in the name of democracy. Good job HH , those threats are now exposed, whatever, will happen, no one will be surprised. Proof is there, picture audios, wina azayenda ku Hague , what is Bushman Kalaba talking about. Evidence is there baba! From what we have seen here in Zambia not In diaspora there is no crisis to seek for intervention foreign bodies. Why be a cry baby before voting? Good Job HH. The threats need to be taken seriously. We love our country too much to sit back and see it go up in flames at the hands of PF. ECL knows he is going to lose and will do what ever it takes to holder onto power. Including opening fire on innocent people. This will cause major unrest in our country. For the first time in Zambian history people need to be scared their lives. PF has encouraged violence like no other Zambian president. Let us all not forget the cold blooded killing of an innocent young lady. Simply for supporting the opposition party. Is that what we call a democracy?? This is tantamount to that little brother at home calling out to mommy that he is being bullied. Why does HH not fight such “abuses” with raw facts, figures and reasoning. He is devoid of such thinking. His macro-economics will never convince that peasant farmer in Chama, Milenge, Kaputa and Mwinilunga. I see him heading for another defeat on Thursday. President Chagwa has all the credentials of a world-renowned statesman. Please give the humble guy a second term on Thursday. This is what happens when one smokes cow dung. HH is suffering from a fear of the future. The future whose content is unknown to us but himself.